National Guard troops use tear gas on picketers in Tacoma during the 1935 timber workers strike. Universal Newsreel, National Archives. Courtesy Ronald Magden. Here is more newsreel and film footage from 1930s strikes. Depressions often break unions. As unemployment soared in the early years of the 1930s, the labor movement seemed helpless, unable to protect jobs let alone wage rates. But even before the first hints of economic recovery, there were signs of the surge of militant union building to come. The Great Depression would ultimately be remembered as labor's finest hour, a time of massive organizing drives, successful strikes, soaring social idealism, and political campaigns that changed labor law for future generations. By the end of the 1930s most Americans realized that unions were one of the keys to genuine democracy. Washington State had long understood unions. The Knights of Labor had been active in Seattle, Tacoma, and Spokane in the 1880s but were soon eclipsed by unions affiliated with the American Federation of Labor (AFL). During the first two decades of the twentieth century there were few cities in the United States more tightly unionized than Seattle. 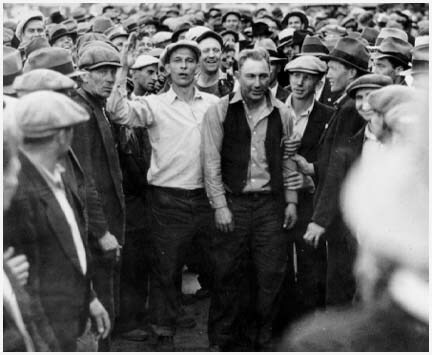 Explore a day-by-day database of more than 600 strikes, protests, campaigns, and labor political initiatives occurring in the state of Washington from 1930 through 1938, culled from state labor newspapers. Everyone from carpenters and street car conductors to waitresses and newsboys belonged to a union. In 1919, when Seattle unions gained worldwide headlines by declaring a general strike that shut down the city for five days, some 60,000 workers belonged to 110 unions affiliated with the Seattle Central Labor Council and the Washington State Federation of Labor. Other cities-- Tacoma, Everett, Bellingham, and Spokane--also knew the strength of organized labor, as did railroad and mining towns throughout the state. The Industrial Workers of the World (IWW) had offered a more radical alternative to the AFL, and had been briefly effective among timber workers and farm workers until federal authorities moved to suppress them during World War I. Some of labor's strength had been lost in the 1920s, a decade dominated by conservative Republicans and business boosterism both in Washington DC and Washington State. The toll increased during the initial years of the Depression. Union membership in the state declined, but it is hard to tell how much since unions were disinclined to publicize their weakness. Strikes became rare between 1930 and 1933. The Washington State Labor News mentioned only a few small and short walkouts. (See Labor Yearbook). The AFL unions turned to politics, seeking legislation to protect wage levels and union jobs. The Seattle Central Labor Council spent the early months of 1931 campaigning for a charter amendment that would have made the five-day week mandatory for city employees, thus spreading out scarce work. But voters, worried either about taxes or about funds to feed the unemployed, rejected it. A few months later, the labor movement rejoiced when conservative mayor Frank Edwards lost a recall election and still more when the City Council named former labor leader Robert Harlin as temporary replacement. But Harlin proceeded to lose favor with voters by appearing to care more about union wage rates than about the thousands of desperate unemployed. He lost his bid for a full term in spring 1932. While union leaders had become cautious and ineffective, a new labor movement was taking shape among the unemployed. In 1931, socialists living in West Seattle launched the Unemployed Citizens League to demand jobs and services. The organization quickly spread and within months claimed upwards of 20,000 members in dozens of neighborhood UCL clubs spread throughout Seattle and other Puget Sound cities. It was the UCL, not the AFL unions, that forced Mayor Edwards out of office. And it was the UCL radicals and a smaller cadre of Communists who would set the stage for the revival of union organizing. The National Industrial Recovery Act, one of the New Deal programs created by Roosevelt and Congress in 1933, included an important new set of rights. Workers would have, for the first time, the right to join unions. Armed with that slogan, activists set out to rebuild old unions and create new ones. Across the nation, 1934 saw huge organizing campaigns followed by major strikes. In Washington, campaigns began in many industries, most importantly on the waterfront and among truck drivers. The single most important strike of the decade began on May 9, 1934 when longshoremen in Washington joined their counterparts in Oregon and California in a walkout that would shut down ports from Bellingham to San Diego for eighty-three days, freezing trade along the coast while creating a supply crisis for Alaska and Hawaii. Before it was over, San Francisco would endure a general strike while Seattle witnessed pitched battles between strikers and police and at least one union death. The war on the docks proved to be a victory for the newly reconstituted longshoreman's union and a victory for unionism on the West Coast. The 1934 waterfront strike inspired a wave of organizing and strikes: among Teamsters, who turned a union that had been strong in Seattle into a union that represented truckers from Mexico to the Canadian border; among loggers and sawmill workers; among sailors, stewards, pilots, tugboatmen, and other maritime workers; among Filipino cannery workers; and many, many others. The Guild Striker was the official paper of the 1936 Newspaper Guild strike against the Seattle P-I. For more information on this paper, click the title above. 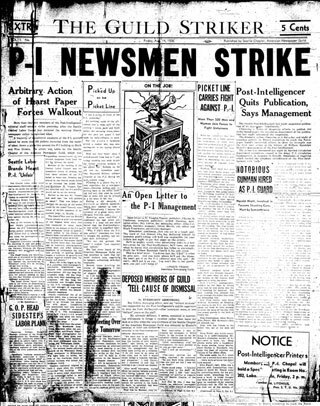 One key achievement was the Seattle newspaper strike of 1936. Journalists were white-collar workers, thus not usually union material. But the American Newspaper Guild had built a base in Seattle's newspaper rooms, including 35 members employed by the Seattle Post-Intelligencer, owned by newspaper tycoon William Randolph Hearst. When Hearst refused to negotiate, the writers walked out and quickly won the support of all the unions in Seattle, including the now powerful Teamsters. Three and a half months later Hearst settled, giving the Newspaper Guild its first victory and cementing Washington's reinvigorated reputation as a state where labor had genuine power. In 1935, Congress passed the National Labor Relations Act, reaffirming the promises of the NIRA and establishing additional rights for workers and unions. That year at the convention of the American Federation of Labor the revived labor movement began to split apart. John L. Lewis, president of the United Mine Workers, called for a new strategy. Unions should be organized on the basis of industry rather than on the basis of craft, which alllowed for the more inclusive organization of nonwhite workers, women workers, and the unskilled. When the proposal was voted down, the UMW and three other unions went ahead on their own, launching what would become in 1937 the Congress of Industrial Organizations (CIO), a second labor federation dedicated to industrial organizing. The split turned into what some called "labor's civil war," as unions sorted themselves into rival federations and fought over members and contracts. In Washington, the International Brotherhood of Teamsters anchored the AFL while the longshoremen, newly renamed the International Longshoremen and Warehousemen's Union (ILWU), anchored the CIO. The aircraft workers building planes for the Boeing Company became one of the prizes in this contest. In 1936 Boeing landed a contract for an innovative bomber that would become the work horse of World War II-- the B-17. The company quickly expanded facilities and with equal dispatch signed a contract with the International Association of Machinists, an AFL union. The CIO won its big prize in the woods. 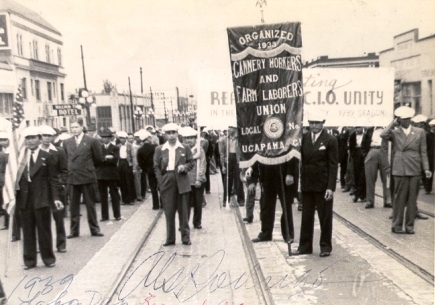 Timber and sawmill workers who had organized in 1935 with a dramatic strike centered in Tacoma were initially affiliated with the United Brotherhood of Carpenters and Joiners, an AFL union. But in 1937, the 70,000 woodworkers bolted, joining the CIO and renaming their union the International Woodworkers of America (IWA). The CIO and the AFL competed over members and also offered competing visions of what unions should do. The CIO faulted the AFL unions for excluding nonwhites and sometimes women and for their modest, if not actually conservative goals. Most of the CIO unions practiced "social movement unionism," advocating an array of social justice programs that included expansive economic rights and also equal political and social rights for minorities. Civil rights was one of the important commitments of the CIO. The AFL charged that the CIO unions were dominated by Reds, were too interested in radical ideas, and that the rival federation weakened what should have been the united front of labor. In truth the political differences were not as great as they seemed. Both labor bodies supported the Democratic Party and worked together on many political campaigns. Although they fought bitterly over some issues, both pushed for reforms that would strengthen the social safety net (including calling for national health insurance). Neither was actually conservative nor actually Communist controlled. By the last years of the 1930s organized labor--despite its divisions--was stronger and enjoyed more legitimacy than perhaps at any time before or since. On Labor Day in 1937, the unions in Seattle put on dramatic display. As 60,000 spectators lined the streets, union after union paraded in organized, banner carrying units--30,000 marchers in all. The parade carried the message that Seattle was once again a proud union town, as were many other locales. Unions took on new meanings in the 1930s. They represented not just better wages and working conditions but a new measure of democracy. Americans of many backgrounds now believed that the right to vote was not enough, that rights should also extend to the work place. Employers should not have absolute power. Workers too deserved a voice and collective bargaining would provide it. Joining unions thus become the smart, respectable, and democratic thing to do. And not just for blue-collar workers. Teachers were starting unions. Retail clerks at Nordstroms and other stores bargained contracts. Cab drivers had organized and the Culinary Workers Union, representing waiters, waitresses, and bar tenders, had almost 5,000 members. Two other unions show the new faith in collective bargaining as a democratic right. The Works Progress Administration had been established to provide temporary jobs to unemployed men and women who could not find work in the private sector. The Workers Alliance, a national organization led by Socialists and Communists, announced that it would serve as the union for WPA workers. Nowhere was the Workers Alliance more successful than in Washington State. Demanding that WPA officials agree to collective bargaining, the Washington branch of the Workers Alliance initiated a walkout in January 1937. It quickly spread across the state, ultimately involving 5,000 WPA workers and shutting down 30 different projects. After two weeks, during which other unions made clear their support, WPA administrators agreed to bargain. Even more revealing of the breadth of labor culture was the Old-Age Pension Union, formed in 1937 to serve as the bargaining agent for elderly Washingtonians who were eligible for a small pension under the state's social security law. The Pension Union was dramatically successful. Thousands joined, supporting the PU demand for bargaining rights and for a guaranteed minimum of $30 every month. King County officials were the first to recognize the new union, followed by other counties and also by state authorities. The Pension Union went on to become a major force in Washington politics, successfully lobbying for higher benefits and in the 1940s passing ballot measures to insure that the elderly received adequate support. The Great Depression had initially humbled the state's unions, but in the end it helped them grow and change. This was the era that changed labor law and put in place expectations about rights and social guarantees that survive today. It was also the era that built the modern labor movement. The Voice of Action was a radical labor newspaper published in Seattle between 1933 and 1936. This paper traces its never-official links to the politics of the Communist Party and its commitments to workers and the unemployed. The Voice of Action portrayed Soviet Russia as a model for an antifascist workers' republic. The Industrial Workers of the World had led the organization of farmworkers in Washington's Yakima Valley. On August 24, 1933, strikers faced 250 farmers, organized as a militia to put down the incipient union organizing among fieldworkers. The 1934 longshore strike up and down the West Coast was one of the most explosive and successful strikes during the Depression. An analysis of three Seattle newspapers here shows the shifts in news coverage for and against the strike. In 1936, two leaders of the Filipino Cannery Workers' and Farm Labor Union were shot to death, weakening the union but also providing the fragmented Filipino community with a cause to unite behind. As the timber workers' 1935 strike became more and more controversial, The Seattle Star became less supportive in their coverage of the issue, leading workers' to develop their own newspaper. A multi-part in-depth essay, drawing from rare archives, of the 1934 longshore strike in Seattle and Tacoma. A special section of the Waterfront Workers History Project, with photographs, films, research reports, and documents from the strike. The 1933 battle between organizing farmworkers and farm owners was part of a long history of farmworker organizing in Washington's Yakima Valley, as well as efforts by radicals to form unions in the region. The striking employees of the Seattle Post Intelligencer, produced The Guild Daily during the 105 day strike against the Hearst-owned newspaper in 1936. Born in the midst of the 1935 timber strike, the Timber Worker was the union newspaper of the International Woodworkers of America, based in Aberdeen, WA. The Longshoremen began one year after the 1934 longshore strike, as the official newspaper of the International Longshoremen's Association. The voice of Boeing workers in Local 751 of the International Association of Machinists, Aero Mechanic was founded in 1939 and has been published ever since. Established in 1939, The Bellingham Labor News was the official publication of the Bellingham Central Labor Council. It was published weekly until 1968 when it merged with other Northwest labor newspapers to become the Northwest Washington Labor News. This paper traces the Washington Communist Party's attempts--and successes--in organizing unions during the 1930s and 1940s. Pritchett, a Communist, became president of the combative timber union on the West Coast, but was eventually denied re-entry to the US because of his red politics.